A new addition to the CCM family who will join us in August 2016, Israeli pianist Ran Dank has been hailed as a “superb pianist… absolutely splendid: dashing, impetuous and full of imagination” by the Washington Post. A favorite of New York audiences, Dank performs in New York City’s most notable venues to frequent critical acclaim by the New York Times. In recent seasons, he has been heard in recitals in Town Hall and Symphony Space. As a soloist, he has performed Prokofiev’s Second Concerto with the Orchestra of St. Luke’s at Alice Tully Hall and Tobias Picker’s Keys to the City at Columbia University. In September of 2013 he and fellow CCM faculty member Soyeon Kate Lee performed the world premiere of Fredric Rzewski's Four Hands at (le) Poisson Rouge to a glowing review by the New York Times. Dank’s other recent performance highlights include recitals at the Gilmore International Keyboard Festival, Washington Performing Arts Society at the Kennedy Center, the Chopin Festival in Warsaw, Finland's Mantta Festival and performances of Pulitzer Prize-winning composer Kevin Puts’ piano concerto with the Mobile Symphony. His recent chamber music performances include appearances at the Santa Fe, Great Lakes, Maverick, Seattle, Montreal, Tokyo Chanel and Bridgehampton Chamber Music Festivals. Last season, Dank returned to his native Israel for a double-bill concert featuring Liszt’s Concerto No.1 and Totentanz with the Jerusalem Symphony. His upcoming engagements include a performance at the prestigious Ravinia Festival, recitals in San Miguel de Allende in Mexico and a return engagement with the Kansas City Symphony. A recipient of numerous honors, Dank won a coveted place on the Young Concert Artists’ roster in 2009 and subsequently made his New York recital debut. 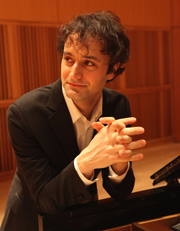 He is a laureate of the Cleveland International Piano Competition, where he also won the Bach Prize, the Naumburg and Sydney International Piano Competitions, and was the First Prize winner of the Hilton Head International Piano Competition. A graduate of the Rubin Academy of Music at Tel Aviv University and the Juilliard School, he has worked extensively with Richard Goode, Emanuel Ax, Joseph Kalichstein, Ursula Oppens and Robert McDonald. In 2014 Dank joined the faculty of the College of Charleston as the Director of Piano Studies and Assistant Professor. He also serves as Artistic Director of the College of Charleston International Piano Series. In addition to concertizing and academic posts, Dank established a series of concerts with his wife, pianist Soyeon Kate Lee. Dubbed “Music by the Glass,” this series is held in a New York So-Ho art gallery, where young professionals mix and mingle with performing artists, who play solo pieces and chamber works. The performances are accompanied by sweet and savory treats paired with wines by the glass. Learn more about these popular events by visiting www.musicbytheglass.com. Bachelor&apos;s, Tel Aviv University, Tel Aviv, Israel. MM and AD, The Julliard School, New York, NY.